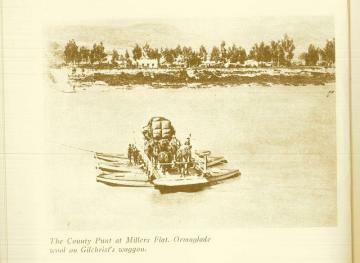 A bottle of "Johnny Walker Whisky", a stubborn punt driver, a frustrated postmaster and a bridge committee of two were the ingredients that lead to the building of the Millers Flat Bridge. John Eady the Puntman in Millers Flat served the district for many years, however he was a stickler for his 30 minute tea time. Unfortunately his tea time often clashed with the Lawrence Coach passing by to collect the mail from the opposite side of the river. As a result the Roxburgh Mail was missed for a week at a time, more than once. Complaints began pouring in. Then one night over a glass of Johnny Walker, Postmaster Laffey and P.C Grant were discussing this frustrating issue and they came to the conclusion that a bridge was the only solution. They then formed themselves into a Bridge Committee of two. This idea then took on a life of its own and grew attracting the support of W. Waugh, R. Richardson, J. Borland, C. Nicholson, J. and G. McDonald who started to get some public Interest in the project. It was certainly not an easy task, and neither was the conversion of the County Council. It was eventually won over, but only with the help James Bennet of Raes Junction and then the chairman. All Four Arches, all 578ft, all of the materials in which were used to build the bridge, were specially imported from England and assembled here. 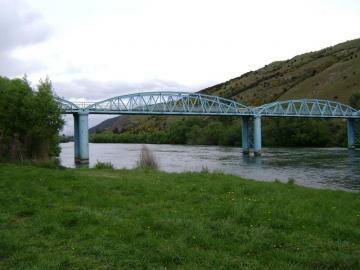 Eventually the bridge was finished by the contractors, Andersons of Christchurch, and then was handed over to Robert Hay, the County Engineer. In 1898 the bridge was completed much to the communities delight. Although this seems strange there was a mistake about the opening date. Everything was all in order from bands playing to flags flying celebrations were in full swing, but Rt. Hon. R. J. Seddon did not arrive. The bridge then had to be unofficially opened that day by a honeymooning couple, A. Maitland, a dredgemaster and Mary Ann Graham. After this the couple took the first journey over the bridge. 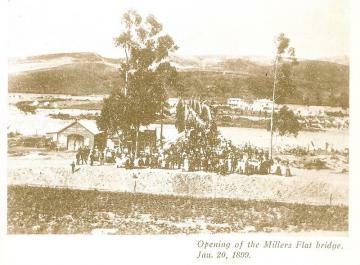 James Bennet then secured a heavy chain across the bridge and read a mandate from the government that stated "No Vehicular Traffic" would be permitted to use the bridge until the opening was preformed by the Prime Minister. 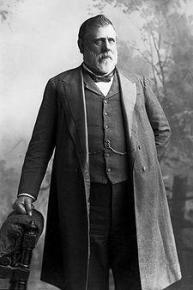 Prime Minister Richard Seddon "officially" opened the bridge in February 1899, rumour has it that he stood on a kerosene box and among other things said that day, suggested naming the bridge "Larnach Bridge". At a celebration banquet later that evening after all the speeches and formalities, the Prime Minister was asked to perform a song. He stood and sang "Hard Times Come Again No More" and Millers Flat and its postal issues were solved. Today the bridge is 110yrs old and largely still in the original condition aside the regular reinforcement of the abutments and installation of lighting as well as our well known blue paint job of the 1980's.